Hear every detail, all around you—this THX Certified system delivers theater quality surround sound for your movies, games and music. Lots of watts You get big, bold sound and details galore from these 500 watt, THX Certified speakers with 5.1 digital decoding. Plug it in No need to plug and unplug your components—you can connect up to six at once for easy access to all your audio. You run the show You’ve got total control over your audio experience with an easy to read and stack digital control console and a wireless remote. Features This THX Certified 5.1 system delivers 500 watts (RMS) of theater quality sound. Digital and analog inputs, an easy to read and stack control console and a wireless remote let you take charge of your entertainment. 500 watts (RMS) of power Make any night opening night. You get thunderous audio that can shake your house—and your whole neighborhood. Digital decoding Hear every detail all around you—from the roar of the crowd to the footsteps right behind you—in your Dolby digital or DTS encoded soundtracks. Easy to read control console The stackable, easy to read design fits in with your home entertainment system and gives you control of your audio—change the volume on all your speakers, turn the power on or off, set inputs and more. Ported, side firing subwoofer 165 watts of deep bass brings your music, movies and games to life. THX Certified You’ve got quality you can count on—these speakers have met strict performance standards to achieve THX certification. Digital and analog inputs You’ve got the flexibility to set up your system the way you want to. 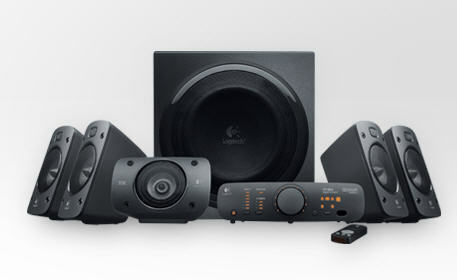 Connect up to six audio sources, including your TV, Blu ray/DVD player, DVR, Xbox 360, PLAYSTATION3, Wii, iPod, PC and more. Wireless remote You can control your listening experience without ever getting off the couch. Wall mountable satellites Let you transform any room into a home theater.